From left: Sen. Betsy Close, Jacob Vandever, Dan Rayfield, Rep. Sara Gelser, and Rep. Andy Olson. What Oregon cities want from the next legislature is, mostly, more money or a way to get more. There are good reasons for this, but there are even better reasons for protecting city residents from upward spiraling tax bills from the cities or the state. At Albany City Hall Wednesday, five mid-valley legislators and candidates listened to a wish list from the League of Oregon Cities. Some of them made sympathetic remarks, but if any one of them committed themselves to support the specifics of any of the cities’ proposals, I didn’t notice. The cities league wants property tax reform, meaning mainly a constitutional amendment allowing local option levies to exceed the rate caps set by Measure 5 in 1990. It’s true that the present system severely constrains the ability of local governments to raise property taxes by persuading a majority of people casting ballots to approve. But that constraint is necessary, because every proposal for a special levy — 4-H programs, veterans’ home, police and firefighters, to mention just a three — is a good one with lots of appeal. Without the tax cap, which forces tax levies to be compressed in order for all of them to fit under it, we’d shortly be back in the 1980s, when property taxes reached the levels that prompted Measure 5. The cities also want other changes in the propery tax system, and those might end up making the system fairer. But they would also make it even more complex — by allowing, for example, different ratios, by taxing district rather than countywide, for establishing the taxable value of new construction. We must face this cold fact: The property tax is always going to be unfair, because it is largely unrelated to one’s ability to pay, and the system of assessment is necessarily imprecise. If the league of cities wants a real solution, it ought to demand that the legislature repeal the property tax and replace it with a sales tax for local government. That would get more people to contribute, and all the endless complications of the property tax would be a thing of the past. 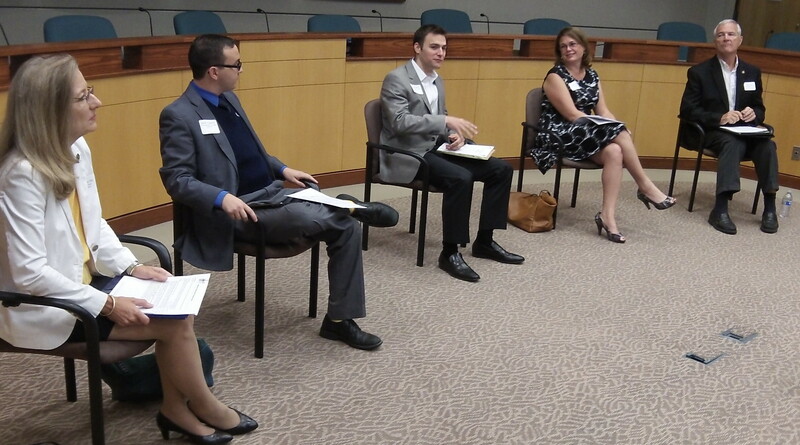 Wednesday’s discussion of these and other topics in Albany was attended by Rep. Andy Olson, R-Albany; Rep. Sara Gelser, D-Corvallis; Sen. Betsy Close, R-Albany; and two House candidates in District 16 (Corvallis and Philomath), Democrat Dan Rayfield and Republican Jacob Vandever. Gelser is running for the Senate seat held by Close, who is seeking election after being appointed to the position. Olson has no opponent for re-election. In the past the “league” endorsed a statewide sales tax, they want to maintain the state income tax, and they now want no constitutional limit on property taxes. I don’t know whether to laugh or cry. Perhaps it’s time to move to a more tax friendly state. I also mentioned that I had a small advantage by having lived in several different states during my tenure with the J C Penney Co. One of them was Wyoming. It had the luxury of “mineral extraction taxes” — at the well head or mine opening. Because of that, their taxing structure was very-very low for the average citizen in comparison to the other states I’ve been in. I agree with Ray to replace the prop tax w/sales tax. The real issue however is the need to reduce the cost of gov’t which is driven by an unwillingness to prioritize/reduce spending and headcount. You’ll never see the League give advice on how to do that.